Discussion in 'Gear Reviews/Test' started by Ratdog68, Dec 19, 2015. Another leather project idea coming your way. After making the tomahawk mask for my buddy (for Christmas), I needed to come up for something for his wife too. 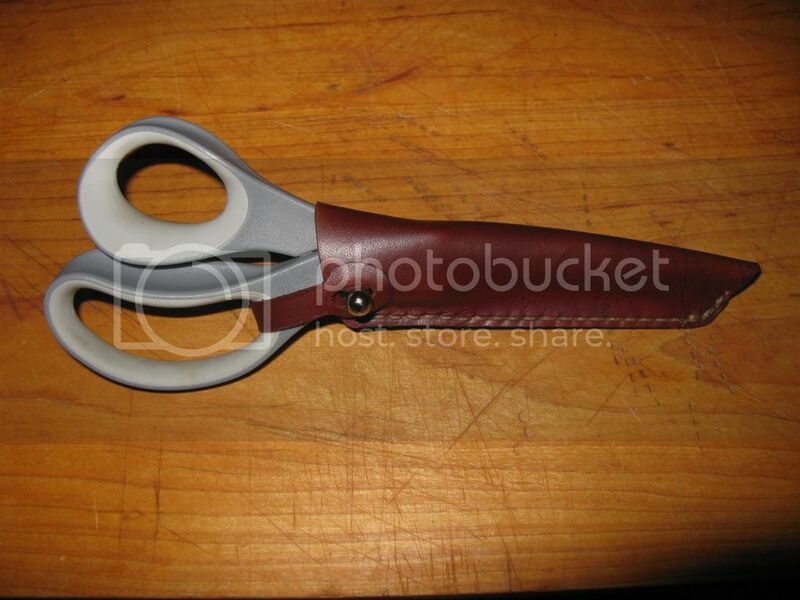 So, asked him to smuggle me her shears. She likes to make things for her kids/grandkids, and usually hauls projects she's working on in a bag. Well, now she'll be able to have her shears a little safer when around little helpers. 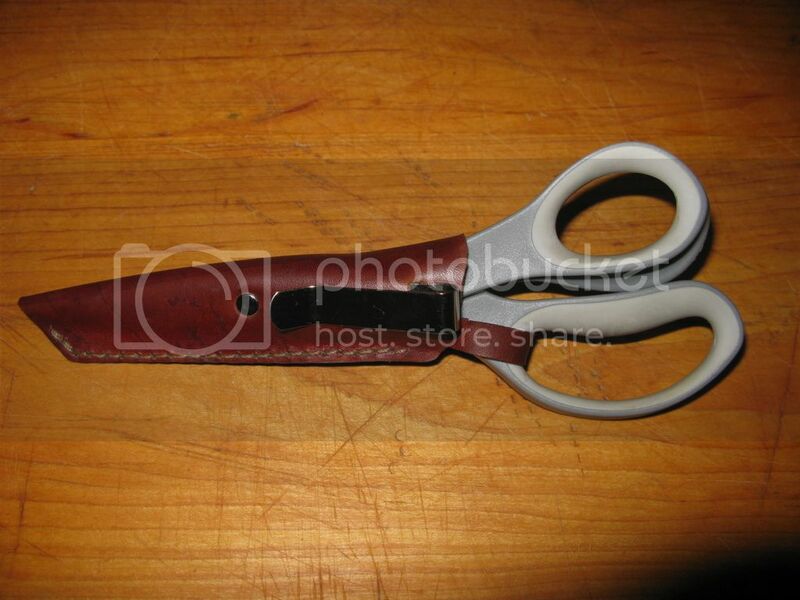 These are a pair of Fiskars Titanium shears, end to end, they're 8 1/2" in length. I cut some veg-tan leather from a paper template I drew out. The hardware placement was marked, holes punched, and slit cut. I used Neetsfoot Oil to prep the leather for dye. The oil ensures an even color dispersing of the dye, and keeps the surface of the leather from cracking... the dye has alcohol as a solvent, and would dry out the leather without pre-oiling. The front side, I selected a Sam Browne button which rivets on. On the back side, a narrow (metal) belt clip is slipped through a slit cut, and riveted in place. The slit is made by punching two holes in the leather, then cutting between them. By doing this, the slit has a defined beginning point and end point, and will not tear further with use. The same process is used for the slit on the tab which pops over the Sam Browne button. The piece was then sewn with a saddle stitch, using waxed thread. The "Fixin' Wax" was then hand rubbed into the leather as a finish. The strap can be secured in place OUTSIDE of the shears handle, allowing them to be stowed/pulled during the time working on a project, without having it get in the way. The clip can be used on the waistband of pants, apron string, belt, or hooked over the top of a craft bag. Chopperdrvr, RattlesnakeDan, sjb67 and 1 other person like this. Hit me up after the holidays. I happen to have more of the same hardware on hand. Thanks for the kind words. Thank you, I enjoy learning what my hands can make. Tomorrow, taking my buddy and his wife to the airport. They're celebrating their anniversary with a trip to San Antonio to see some warmer climate. I'll borrow her shears/sheath while they're gone so I can fix my stupid... and make a template. You still wanting one for your wife Oso? You older guys have your wives all figured out right? LOL... no problemo. While I have 'em, I'll make me a pattern anywho. Yup, mine has a world-class cheating gene. Been rid of that critter for about 25yrs. Last I heard, she'd been divorced by her fourth hubby... yup, for cheating on him. That was about a year ago, or so. LOL The comical part here is... her excuse for wanting a divorce from me was... "Didn't wanna be married anymore." Finding a good'n is rough, don't even try to figure (even the good'ns) 'em out. Oso Grande and Ratdog68 like this.